Human Appeal’s work is inspired by the Muslim faith, so we understand the significance of charity in Islam and the importance of fulfilling the duty incumbent on all Muslims. The importance of donating during the blessed month of Dhul Hijjah shouldn’t be understated, but we must also remember the unique rewards of Sadaqah Jariyah. Human Appeal’s Sadaqah Jariyah projects are designed to be long-lasting, ensuring that you – or your loved ones – can reap the benefits of the ongoing charity long after the donation has ended, and even after you are gone. A Sadaqah Jariyah project is special. It doesn’t just provide a vulnerable family with immediate aid, but gives them the tools to generate income for the years ahead. Sadaqah Jariyah is a charity that keeps on giving. You can choose from any of our three current Sadaqah Jariyah projects. You could donate olive trees to be planted in Gaza, their fruits and oil benefiting generations to come. 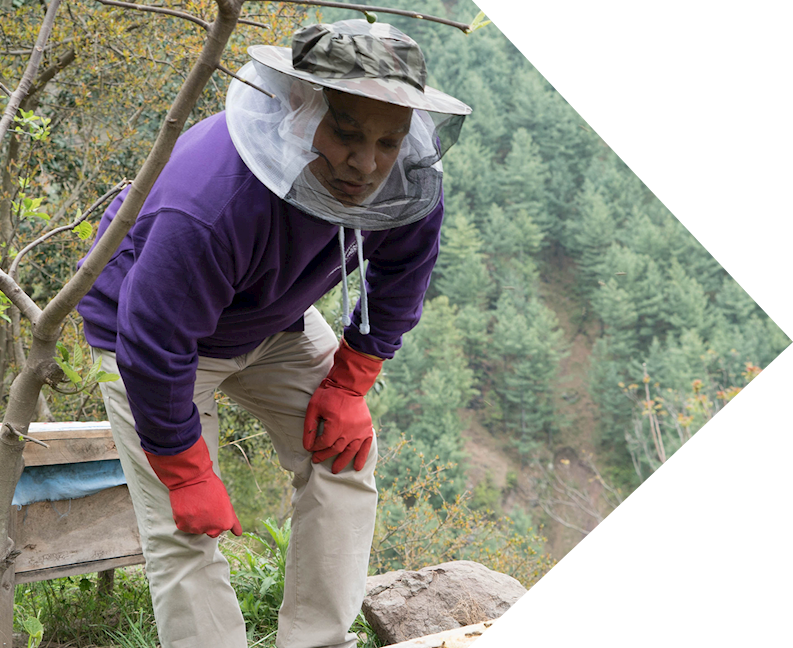 In Pakistan, we run a beekeeping project that offers local breadwinners with sustainable and innovative sources of income, by providing them with training, equipment and tools. Or how about providing the gift of water, described as the best of charities by the Prophet (PBUH). You can donate to our water project in Gaza, providing technology that will continue to make water safe and drinkable for years to come. Provide the livelihood of a family by helping them open a small, home-based bee farm. Human Appeal has helped over one hundred male and female farmers in Pakistan with this opportunity so far. £350 will provide one person with three days of beekeeping training, protective clothing and the tools needed to harvest and maintain the honey. The newly-trained beekeepers will also receive four hives and will have access to free technical support. 90 percent of our beekeepers have expanded to open more hives. Your Sadaqah Jariyah will help families through an innovative and life-changing project. If you want to help a family start a honey business, give us a buzz. Olive trees produce great sources of oils and nutrition. In Gaza, the dry pulp of the seed is burned for fuel or used as animal fodder. Olive oil is a Sunnah food recommended by Prophet (pbuh) to be used for skincare, medicine, massage and acupressure. With your help, Human Appeal have planted over 50,000 olive trees in Palestine, providing a source of income, food and medicine to thousands of farmers and their families. Just £20 will buy two olive trees, which may continue to grow for over 1,000 years, benefiting a farming family for up to thirty-five generations. Donate today to lay down the roots of sustenance for years to come. 90% of water in Gaza is unfit for human consumption due to high salinity levels and sewage contamination. You can help to clean the water available Gaza by donating towards water filtration plants in Gaza, which will continue to provide clean water in future years too. Human Appeal has improved access to clean water. In 2015 we installed desalination systems in 64 Gazan schools. The following year we provided clinics and hospitals with clean water via a desalination plant, benefiting 100,000 people. Provide Palestinians with the best of charities for years to come. Istiaq was one of the first people that Human Appeal helped to train as a beekeeper. Today, he is well known in his community for his medicinal herb knowledge, which he often produces using honey. Before opening up a bee farm, Istiaq relied on the small income he received as a teacher. Human Appeal’s Sadaqah Jariyah projects are designed to be long-lasting, ensuring that you – or your loved one – can reap the benefits of the ongoing charity long after the donation has ended, and even after you are gone.